In a crowded chamber in the Commons yesterday, Theresa May told MPs: "the draft text that we have agreed with the Commission is a good deal for our country and for our partners in the EU. It honours the vote of the British people by taking back control of our borders, our laws and our money, while protecting jobs, security and the integrity of our precious United Kingdom". And so it comes to pass that our prime minister is reduced to the status of a common liar. By any measure – other than that of Mrs May and her cohorts - the draft withdrawal agreement is a very bad deal. Not in any way does it honour the vote of the peoples of the United Kingdom – a group which our prime minister consistently fails to address, as she refers to Britain and not even Great Britain. 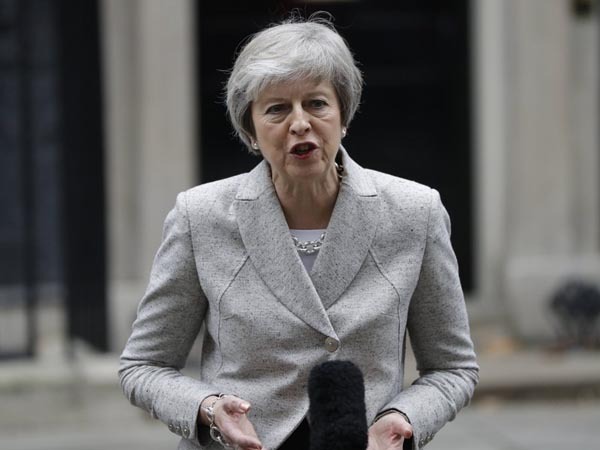 Unabashed, she delivered much the same mendacious message standing outside No.10 Downing Street (pictured), announcing that approval of the whole package, which now includes the political declaration, "is within our grasp". Attempting to adopt stern, Churchillian tones, she concluded by declaring that she was "determined to deliver" this fabulous agreement. But, if she intended to inspire, she did not. All she managed to do was sound faintly ridiculous. What isn't ridiculous is that political declaration. A mere 36 pages of double-spaced text (including the cover page), it was agreed yesterday afternoon by the EU-UK negotiating teams. But, if the sudden "breakthrough" was theatre, it wasn't very good value. They didn't even spin it out until Saturday. The substance of this thing is very much as one might expect – a template for a comprehensive free trade agreement that belies Mrs May's suggestion that she has somehow evaded the EU's attempts to confine the UK to the binary choice of Norway or Canada. Mrs May argues that the political declaration recognises that there is a spectrum, with the extent of our commitments taken into account in deciding the level of checks and controls. But, in more general terms, she had a binary choice between a multilateral or a bilateral agreement and she's chosen the latter. The rest is detail. The best we can even aspire to is a variation of the Canada agreement, with some tweaks and some additions. As always – but more so here – the devil is in the detail, and there's an awful lot of it, enough to keep many teams of negotiators busy for many years. Perhaps, therefore, the most significant part of the declaration is Article 144, towards the very end. With the intention of concluding an agreement that can come into force by the end of 2020 (Article 138), and working within the framework of Article 218 (TFEU), it is envisaged that the Parties will "negotiate in parallel the agreements needed to give the future relationship legal form". That means that the intention is to avoid sequencing, where one part or chapter must be agreed before moving onto the next, which is the way the withdrawal agreement has been handled and the way accession treaties are negotiated. However, while the willingness may be there (in theory), such a process is highly manpower-intensive and it may be that the Commission will not want to (or can even afford to) commit the resources necessary to secure expeditious progress. Nevertheless, we should see some signs of where they stand very quickly after Brexit. The intention is that, immediately following the UK's withdrawal, the Parties have committed to agreeing a programme setting out the structure and format of the negotiation rounds and a formal schedule of negotiating rounds. Setting out such a detailed timetable is rare, and represents a huge gamble on the part of the UK. It gives a venal media exactly the sort of points they can focus on, which even the average political correspondent can understand – a series of cliff-edge deadlines over which they can hyperventilate without having to address any of the details. Drilling down into the detail, we can already see that the future agreement is built round concessions which the UK will have to make for the thing to work. Clues can be seen in the juxtaposition of multiple contradictory statements in Articles 24 and between that and Article 25. The combination rather gives the game away. Opening Article 24, we see the "motherhood and apple pie" sentiment to the effect that the parties will be "preserving regulatory autonomy", followed by the commitment to "put in place provisions to promote regulatory approaches that are transparent, efficient, promote avoidance of unnecessary barriers to trade in goods and are compatible to the extent possible". Of course, if "unnecessary barriers to trade in goods" are to be avoided, then there must be regulatory alignment. That means that "regulatory autonomy" on one side or the other will have to go. And we don't even have to guess which party will have to make the sacrifice. Article 25 tells us that "the United Kingdom (not just 'Britain') will consider aligning with Union rules in relevant areas". If there is to be anything approaching frictionless trade – and the gentlemen and ladies of the press have already noted the absence of this phrase from the declaration – then the UK will have to do a lot more than "consider". Here lies the vassal's charter, with not even the tempering provisions of the EEA, which require consultation on all new initiatives. In fact, the UK admits later on in Article 24 that we will have to go much further than mere regulatory alignment. "Disciplines on technical barriers to trade (TBT) and sanitary and phytosanitary measures (SPS) should build on and go beyond the respective WTO agreements", the Article says. Taking us into the spider's web of the EU's regulatory "ecosystem", it tells us that the TBT disciplines should set out common principles in the fields of standardisation, technical regulations, conformity assessment, accreditation, market surveillance, metrology and labelling. As far as animals and animal products go, the parties commit to treating one another as single entities as regards SPS measures, "including for certification Purposes". Furthermore, they will "recognise regionalisation on the basis of appropriate epidemiological information provided by the exporting party". Effectively, we remain within the orbit of the EU's regulatory system, with profound implications for making trade deals with other third countries outside the EU sphere of interest. This is a straight rebuttal of the claim that the "British" people will be "taking back control of our laws". We won't. Another climbdown lies within the realms of our relationships with EU agencies. In March 2018, the fatuous Mrs May spoke at the Mansion House in London, arguing for something she had absolutely no chance of delivering. "We will also want to explore with the EU, the terms on which the UK could remain part of EU agencies such as those that are critical for the chemicals, medicines and aerospace industries: the European Medicines Agency, the European Chemicals Agency, and the European Aviation Safety Agency", she said. Burbling on, this stupid woman then declared that we "would, of course, accept that this would mean abiding by the rules of those agencies and making an appropriate financial contribution", before going on to set out what would be the non-existent "benefits" of this approach. Associate membership of these agencies, she said, is the only way to meet our objective of ensuring that these products only need to undergo one series of approvals, in one country. The agencies had "a critical role" in setting and enforcing relevant rules, and associate membership could permit UK firms to resolve certain challenges related to the agencies through UK courts rather than the ECJ. Coming down to earth with a bump, all the declaration will allow is for the parties to "explore the possibility of cooperation" of UK authorities with agencies of interest. Anyone with the slightest knowledge of EU law would tell you that this had to be the case. But our brilliant prime minister knew better. And for her next trick, she will walk across the English Channel to get to Brussels. What she doesn't escape from though is "a fair and appropriate financial contribution". She doesn't get a ticket to the party, but she still has to pay the bills. Moving on, we find customs dealt with in a completely separate section, defined by Articles 26 and 27. The Parties are to "put in place" ambitious customs arrangements, in pursuit of their overall objectives. In what has been hailed as a resuscitation of "MaxFac", the Parties envisage making use of all available facilitative arrangements and technologies to achieve this. And that actually makes sense – the direction of travel in customs management is towards more automation. But, in a distinction that will be missed by many, this provision applies only to customs. Technical barriers to trade and the all-important sanitary and phytosanitary provisions lie outside the scope of these Articles. Thus, while "facilitative arrangements and technologies" will also be considered in developing any alternative arrangements for ensuring the absence of a hard border on the island of Ireland on a permanent footing, broad spectrum regulatory checks are still on the agenda. Altogether, Mrs May's government has taken us down this laborious road to achieve so very little that even the meanest intellect must be wondering why we didn't go for the much superior Efta/EEA option. But that won't include Mrs May. She is in "broadcast only" mode, settling out to sell her package to the indolent and terminally thick. Outside parliament, she will also have to struggle, but when a prime minister is prepared to lie, and does it so fluently, the world is her oyster. If she repeats her lies often enough, there may be enough people who will believe she has achieved something worthwhile. In reality, she really has sold us out. But we knew that had to happen ever since her 2017 Lancaster House speech. A flock of rather bedraggled chickens has come home to roost.